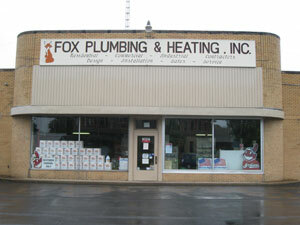 Fox Plumbing & Heating Inc. is proud of our years of service to the Galion area and look forward to helping you with your home or business needs. Our areas of expertise include residential, commercial, and industrial market places. We specialize in hot water and steam heat, forced air systems, plumbing work, camera and location for sewers, air conditioning, well pumps, water softeners, custom sheet metal work, gas service and house lines. We are licensed and bonded contractors and are certified to install and service medical gas systems for hospitals and dental offices. We are also certified to install, check and repair backflow devices. We have a full line of repair parts for many makes and models of equipment as well as a stocked showroom. We provide water testing for swimming pool and spas as well as chemicals and repair parts for both. If you are thinking about remodeling a bathroom or purchasing new equipment for your home, Fox Plumbing & Heating will provide you with the best equipment available. We feature a full line of heating and cooling equipment. We stock many products to choose from including Kohler, American Standard, and Rheem. Our Carrier furnaces and air conditioners are among the most advanced and efficient on the market today. Call us for a free quote! We would like to thank all of our loyal customers for their continued support over the years and welcome new customers. We appreciate your business and will be here for you when you need a professional. Copyright © 2019 Fox Plumbing and Heating Inc. All Rights Reserved.